Potassium is an essential nutrient for plants , one of the three macro-elements – nitrogen, potassium and phosphorus (NPK), as it is absorbed by plants in relatively large quantities. 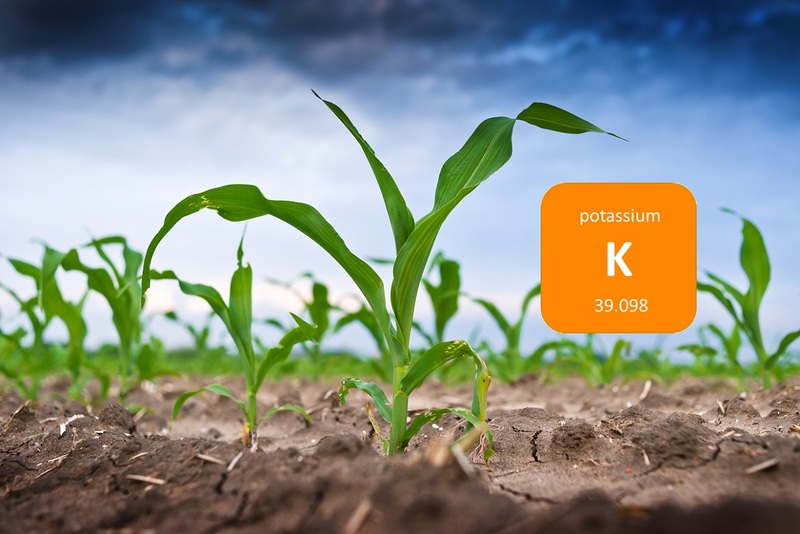 Potassium enhances crop yields and quality in different ways. For example, it increases sugar content in fruits, size of vegetable crop fruits, protein content in cereals, helps maintaining longer shelf life, improves the plant resistance to diseases and to drought and more. Regulates stomata opening/closing – in order to open the stomata, potassium is actively pumped into the guard cells (the cells that surround the stomata). This reduces the osmotic potential inside the cell and water enters. Stomata close when potassium is pumped out of the guard cells. Potassium affects gas exchange in plants. By regulating the opening and closing of the stomata it regulates exchage of CO2 and O2 with the atmosphere. Potassium is involved in the synthesis of ATP (Adenosine triphosphate), which all cells use for energy. Regulates and improves water uptake – potassium that accumulates in root cells results in water entering into the root. Activates enzymes – potassium is needed for the activation of many enzymes. It changes the three dimensional structure of the enzymes and, as a result, their rate of reaction and affinity for the substrate increase. Required for protein metabolism. When there is no sufficient potassium supply, protein synthesis stops. Required for proper uptake and use of other nutrients, such as nitrate (NO3–), which is required for protein synthesis. Potassium accompanies nitrate, as a counter-ion, as it translocates within the plant. Deficiency symptoms may vary among crops. However, the most common visual symptom of potassium deficiency is scorching and yellowing of leaf edges, while the inner side of the leaf remains green. Leaf edges eventually become brown and die. Poor yield quality – size, uniformity, sugar content, protein content etc. The crop might be more susceptible to diseases. Potassium is absorbed by plants as K+. The availability of potassium for plants is mainly dependent on soil composition and properties and on cultural practices. Heavy, clay soils, have a higher cation exchange capacity (CEC) and, therefore, retain more available potassium than light, sandy soils. Acidic soils also have lower CEC, because H+ ions occupy the exchange sites on soil clay particles. As a result, there is less potassium available for the plants. There are various types of potassium fertilizers available. They are all soluble, however, some potassium fertilizers may contain insoluble compounds, such as iron oxide. Composition: 60% potassium as K2O (50% K) and 45% Cl–. A highly soluble potassium fertilizer. Should not be applied to crops that chloride-sensitive or to seeds. Most economic source of potassium for plants. Composition: 13% nitrate nitrogen and 46% potassium as K2O (38% K). Serves also as a source of nitrogen. Has a relatively high cost. Used mainly for greenhouse crops and in hydroponics. Composition: 52% potassium as K20 (43% K) and 54% SO42- (18% S). Has a relatively low solubility. Mainly used for chloride-sensitive crops and when sulfur fertilization is required. Composition: 34% potassium as K20 (28% K) and 52% phosphorus as P2O5 (22.5% P). Other types of fertilizers that contain potassium are available, mainly compound fertilizers that are composed of the above straight fertilizers. These fertilizers contain three elements and more. 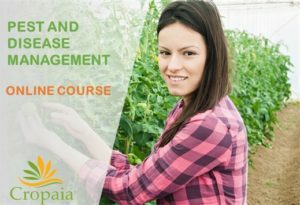 Pest and Disease Management - Online Course.